What are the benefits of using awnings as window coverings? Are you looking for ways to reduce heat loss for your home? Then it’s time to cover your windows.Awnings can serve as great window coverings because awnings are available as retractable awnings and fixed awnings. 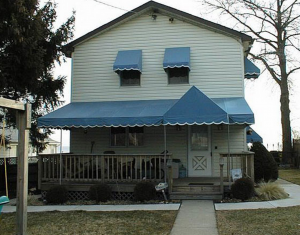 Custom awnings can be designed to fit any window sizes. Window awnings are great additions to residential properties because the custom awnings are available in a variety of awning fabric colors and fabric weaves to enhance the visual appeal of your residential property and provide better insulation for your home. If you have retractable awnings installed for your home, you’ll have the opportunity to automatically control your awnings or control the awnings by a manual motor. With your retractable awnings or fixed awnings, you’ll have better control over window shades and level of glare protection. You’ll have the opportunity to protect your home and furniture from damaging ultra violet rays. In fact, awnings function better than interior blinds when it comes to window shades and ultra violet rays protection. If you’re in need of very durable awnings, we recommend purchasing stationary awnings. You can removable aluminum awnings installed if you plan on using your awnings as window coverings for specific seasons such as Winter and Summer. By having the right awnings installed to accommodate your lifestyle, you can save home energy better and save money monthly on tire home maintenance cost. Have your residential awnings installed not only for windows but also patios and decks. Awnings will reduce your heat gain during times when cooling is necessary and increase your heat gain during the coldest times of the year. No other type of window covering can simultaneously provide this type of excellent coverage. Awnings can help you maintain good heat gain during the winter because residential awnings can protect your home from nighttime sky radiation that removes heat from the home. If you’re ready to lower your energy bill and improve the beauty of your home property today, Carroll Awning Company has you covered. Our opaque and tightly woven awning fabrics will keep your home feeling cozy and warm all winter long. We will heat up your home.